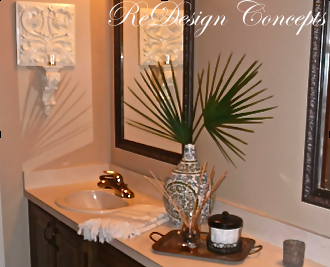 After the remodel of our master bath, I decided to redesign what I could without a total remodel in our guest bath...that comes later. :) Looking for a "spa-feel", I lightened and brightened it by repainting it from apricot to a more neutral toned-down taupe using accents of blue, white and brown. 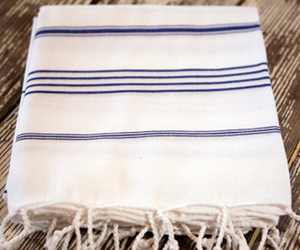 A friend who is opening a yoga studio in South America will be using Turkish bath towels for her guests. I thought that would be an interesting addition to my "spa-like" guest bath. Using elements from around the world makes for a more interesting room and these Turkish bath towels were just the ticket. I found mine at an online store turkishtowelstore.com and shipped directly from Turkey. For a little history behind Turkish towel or pestemal, the Turkish towel was produced by weaving on hand looms by women in Turkey's Eastern Black Sea and Aegean regions and have a history of almost six hundred years. Nowadays pestemal is woven on electrically-powered advanced looms. These beautiful towels are a nice big size that come in lots of rich colors. Colors represent the region of the person wearing it . I've read that many celebrities such as Jennifer Aniston, Demi Moore, Robert De Niro, Steven Spielberg and Bill Gates use them at the beach. They can be used as a tablecloth, a throw for your sofa or bed or wherever you need some fabric in a room. I have a blue and white one folded on the bath counter and a matching one on a seagrass bench in the guest room. 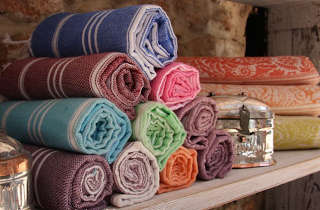 If you had Turkish bath towels, where would you use them? I would love to hear your ideas! I would like to thank you for the efforts you have made in writing this post. You can find out the Luxury Bath Towels Online with various design collection.